Don’t we all love gold? It sparkles. It represents indulgence, royalty and perhaps perfection. But, how much gold can be considered too much? 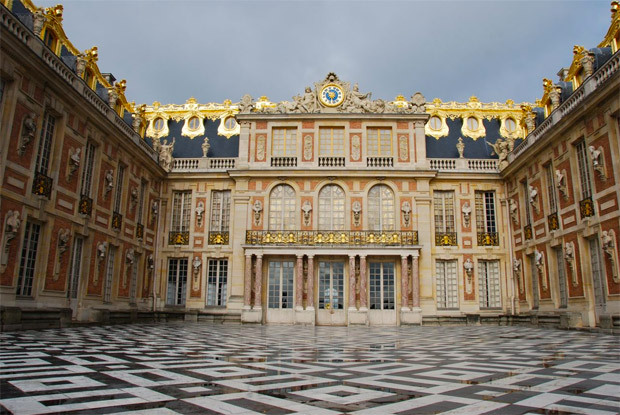 Let’s take a peek into the Palace of Versailles to find an answer to that. 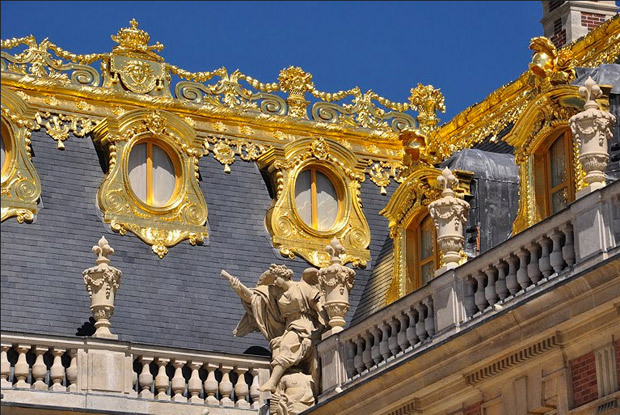 It would be safe to say that the word “gold” beautifully and aptly describes the entire palace at Versailles. Gold is a reference to the reign and the majesty of Louis XIV, known as The Sun King, the longest reigning king in the European history. 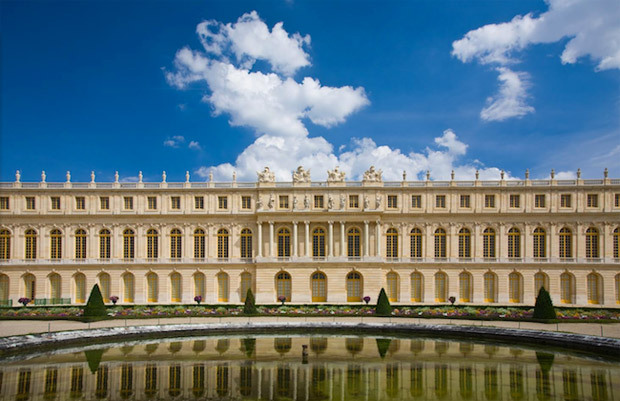 Louis conceived the Versailles Palace, located 13 miles southwest of Paris, which had been the political capital of France from 1682 to 1789 and the opulent home of many French kings. Generations of architects, landscape designers, sculptors and decorators worked on the palace, one of the most magnificent estates in the world. 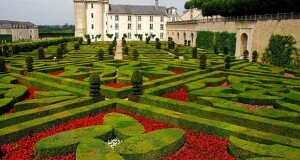 It features 700 rooms, 67 staircases, 2,153 windows, 27 acres of roofing, and 55 fountains. Gluttony and indulgence also describe the palace as well. 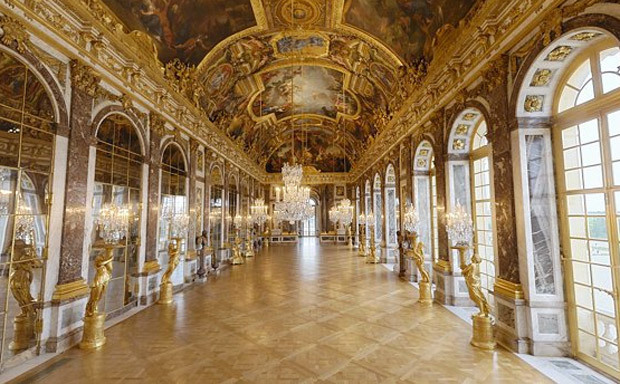 Nowhere in the palace do these words ring more true than the Hall of Mirrors, especially when in the 17th century mirrors were among the most expensive items to possess. So it seems natural that the principal features of this hall are the seventeen mirror-clad arches that reflect the seventeen arcaded windows overlooking the gardens. Each arch contains twenty-one mirrors with a total complement of 357. 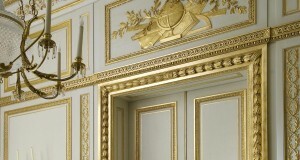 And when coupled with the gilding, the mirrors look c’est tres magnifique. In the main-floor apartments, including the King’s Suite and Queen’s Suite, most recent restoration work involved new wall coverings and the application of fresh guild on hundreds of door and window frames, moldings and ornamental carvings. To gild a typical 12-foot-high window frame, for instance, one person took three months of steady work and 1,000 three-inch square sheets of gold leaf! 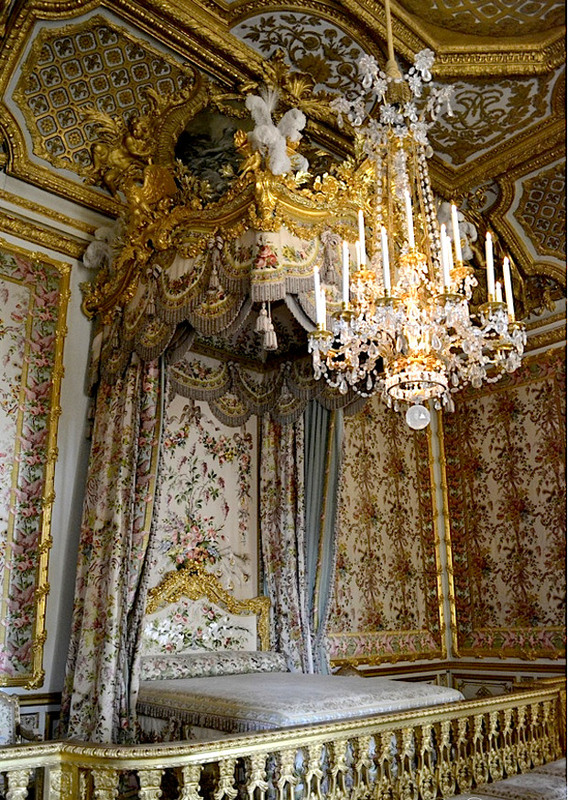 In 1701 Louis XIV moved his bed-chamber into the drawing room, lying east-west of the Palace, facing the rising sun. The three glazed doors into the Hall of Mirrors at the back were blocked off so as to form an alcove for the bed. 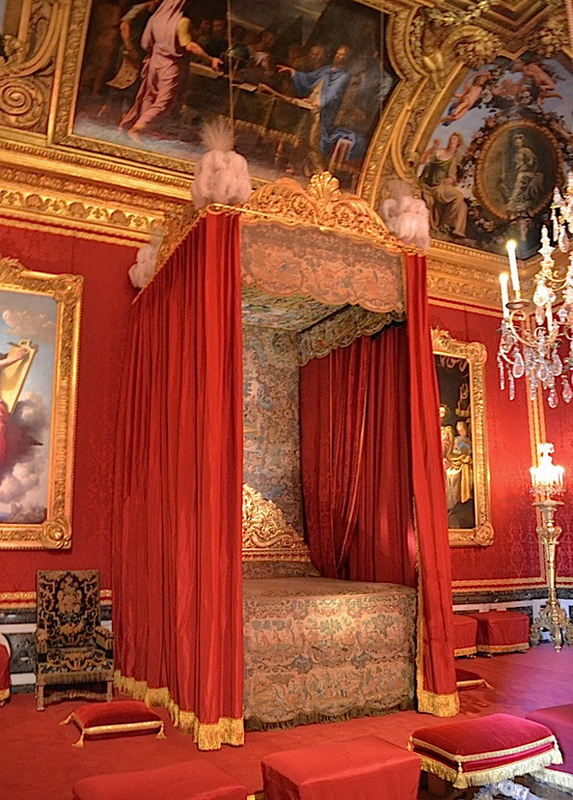 Nineteen royal births took place within The Queen’s bed-chamber where, oddly by today’s lifestyle, the bed itself is dwarfed by the size of the room and the height of the ceiling. 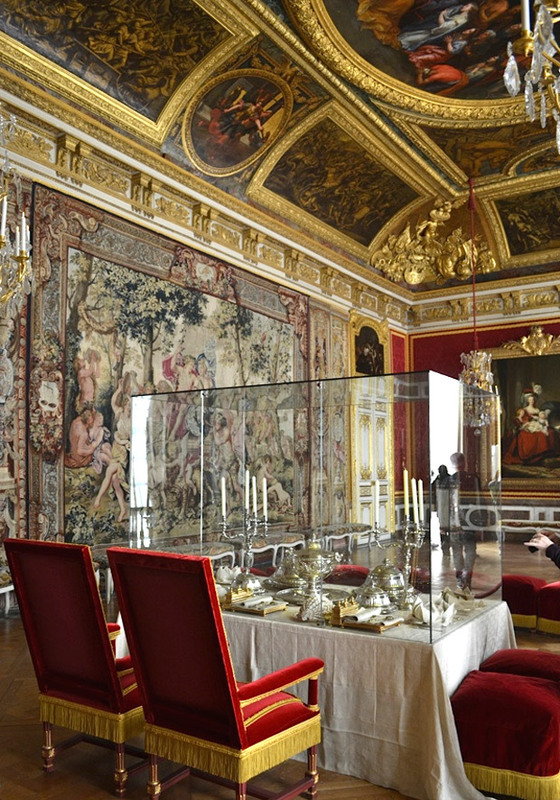 Public meals were eaten in the Queen’s Antechamber. The King and Queen sat in the two chairs at the table. Duchesses sat on the stools facing the King and Queen, while other members of the court stood watching them. 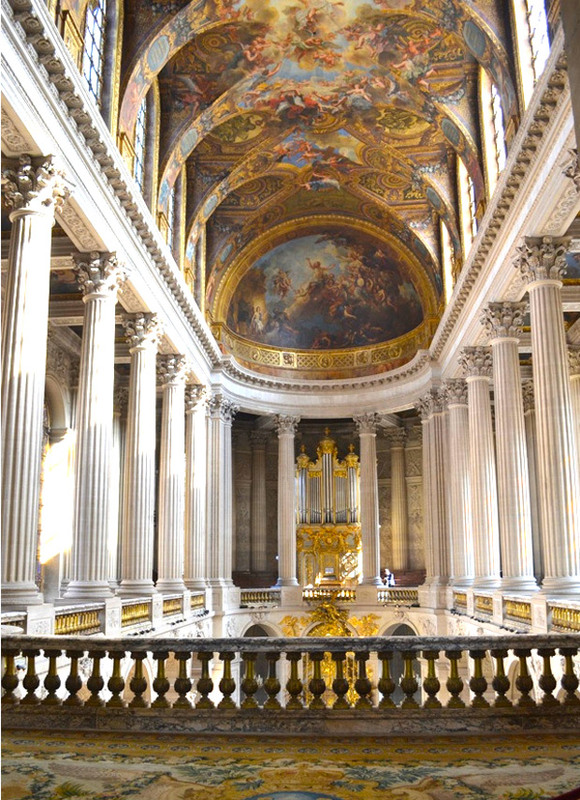 One of the most impressive sights in Versailles is The Chapel Royal. Every day at 10am, the court would attend the King’s Mass. Because the French Monarchy believed that the King was chosen by God, the paintings and sculptures in the chapel represent the idea that the king was God’s lieutenant here on earth. 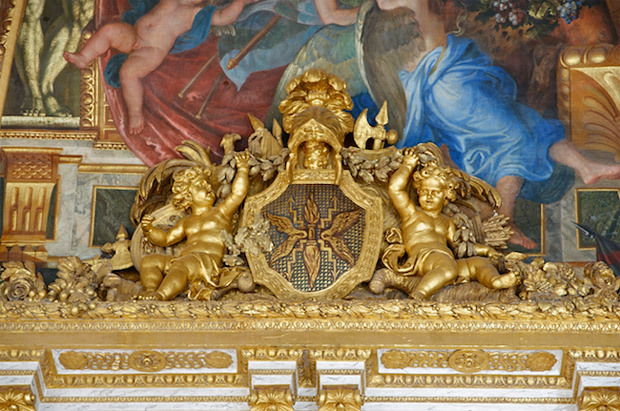 No expense was spared on the gilded furniture in the palace either. It is so exquisitely detailed that each piece seems to require a magnifying glass to appreciate every stroke of the master craftsmen who created it. 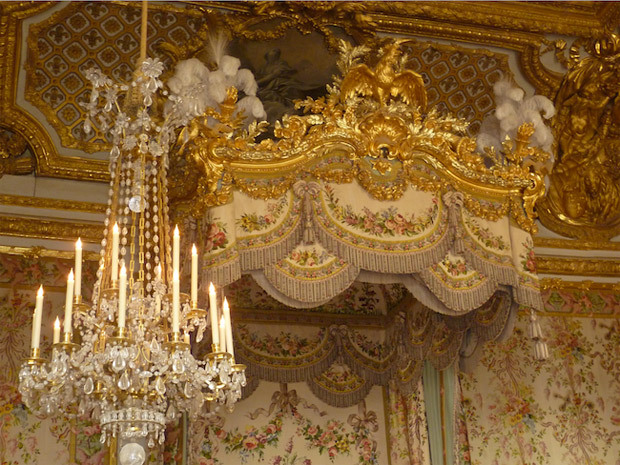 Now, I ask you, is the gilding in the Palace of Versailles beyond comprehension? 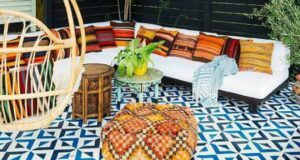 The scope of the creativity, the talent of the artisans, the time and the expense involved boggles the mind. If you are fascinated by this little peek into the palace of Versailles and would like to see more, current restoration of the Latona Fountain is in process and it can all be seen on the Chateau Versailles website. Especially relevant to this post is the cool video below that shows how gilding is applied to the intricate designs of the 60 garden statues using traditional techniques by artisans. Should we think that Versailles has embarked on some sort of guilt trip? Restorations on all the lead statues in the garden were originally gilded, but only those inside the bosquets or formal gardens, will be recovered in gold. “Otherwise, it would be too much of a shock.” Indeed. Be sure to watch for DIY gilding projects like this Verre Eglamisé Glass Table Top on Paint + Pattern that are easy and fun to do! NEED. TO. GO. Incredible post, Debbie! Magnifique post Debbie, Bravo !! What i do not understood is in fact how you are not actually much more neatly-liked than you might be right now.You are so intelligent. You understand thus significantly in terms of this topic,made me personally imagine it from numerous varied angles.Its like women and men don’t seem to be involved except it is somethingto do with Girl gaga! Your individual stuffs great.Always deal with it up!